Stories of super heroes go something like this: a young person is exploring himself / herself and the world, and he or she discovers a prior-hidden super power (or undergoes an experience that leads to the creation of a super power). After crossing this Rubicon, he or she has to decide how to use his / her capabilities—for good or for evil. The prior narrative trajectory can also be applied to profoundly gifted students, those with IQ scores above 150, or those in the top tenth of 1% of the population, several standard deviations above the norm. But counter to many superheroes stories, building the gifted individual will require a village. Roya Klingner’s “Gifted Underachiever: Education in a Competitive and Globalizing World” (2017) explores this phenomenon with works from authors hailing from several countries. The challenge of the “gifted underachiever” goes something like this. There are children who are born with high intelligence and capabilities that can be harnessed but only if they are identified sufficiently early and supported well in their learning—with the right emotional and psychological supports from families and schools, with adaptive instruction, with access to necessary resources, and with their protection against being harnessed for profit-making ends or other mis-uses. Young gifted learners may not be recognized as such. They may be discouraged from exploring their capabilities with rigid school systems. They may be mishandled by inept parents or guardians. Their potential is left untapped or only partially tapped, and their talent is lost to posterity. That said, from birth to about ages eight or nine are critical years for human development and learning. In those ages, children are not particularly aware of their intellect and capabilities, and those who are particularly gifted will perceive their “difference” but not understand what that may mean or how to harness it. And giftedness, if unused or unexplored, may dissipate. Harnessing Untapped Talent to Compete? An appreciation for learning is thought to be native to people and to be especially intrinsically rewarding for the gifted. Over-achievement may be something that people do for others, as a result of external social pressure. Education, in a market-oriented framework, may “prioritize production, set targets, benchmarking, quality assurance, and accountability, rather than to necessarily prioritizing individual students’ or employee’s needs, interests, and uniqueness (Ingersoll, 2003; Lundgren, 2011; Puigross, 1997; Ravitch, 2009; Sallis, 2002, as cited in Persson, 2017, p. 9). Overweighting how much influence people may have on others’ capabilities can be detrimental, not only in the West. In what he calls “Confucian cultures,” school-aged children have been driven to suicide with the over-focus on achievement and performance (Persson, 2017, p. 15). Better, faster, stronger…? It is important to bring some common sense to the issue of giftedness and external performativity. Why people do not perform at a high level may depend on a number of factors: “location, discrimination, economy, gender, sub-culture, ethnic culture, organizational culture, disability, family and social context, (and) delinquency” (Peters, Grager-Loidl, & Supplee, 2000, as cited in Persson, 2017, p. 6). The question is how to balance common sense against false narratives of superhuman capabilities by instruction and inducements. Karen B. Rogers’ “Underachievement and Giftedness: Fission and / or Fusion?” (Ch. 2) identifies a list of challenges to gifted individuals to achieve their full potential and suggests ways to overcome those challenges. Researchers have taken stock of some indicators of underachieving. The gifted learner may be over-cautious and reluctant to take risks. They may be so perfectionistic that they cannot get started on work. Characteristics of underachievement include “forgetfulness, disorganization, carelessness and superficial task completion, non-academic interests, manipulative relationships with parents and teachers, (and) loneliness and social withdrawal” (Rimm, 1986, as cited in Rogers, 2017, p. 36). Further, there are both “home” and “school” causes for gifted underachievement. For the latter, these include “perfectionistic teachers, ‘sage on the stage’ teachers, under-challenging curriculum, inconsistent teacher/school expectations for performance, and an anti-intellectual learning climate” (Rogers, 2017, p. 36). Gifted underachievers may engage in personal behaviors that contribute to the underachieving, including choosing companions “who do not like school” and feeling “hostile toward adult authority figures” and having “low aspirations for future, career” and externalizing “conflicts” (Clark, 2012, as cited in Rogers, 2017, p. 39). By contrast, based on a synthesized view from the research, gifted achievers take pride in their own work. They are resilient “when things go bad.” They practice risk-taking. They are self-disciplined. They set goals and follow through on the work necessary to actualize those goals. They have specific and intense interests (Heacox, 1991, as cited in Rogers, 2017, pp. 37 - 38). Rogers is professor emerita at the University of St. Thomas, in Minnesota, USA. Jessica Potts’ “Underachievement in Profoundly Gifted Students” (Ch. 3) focuses on those students whose IQ scores are in the top tenth of 1% of the population (with IQ scores > 150). By definition and manifestation, these “profoundly gifted” are extremely rare (above the 99th percentile), and often, their learning needs cannot be met in their respective schools (Potts, 2017, p. 51). Empirical research bears out some of the expectations. A study of those learners with high SAT scores at age 13 found that these individuals were linked to “high creative production (e.g., the production of patents, peer-reviewed articles, tenure track positions at universities) later in life” (Potts, 2017, pp. 54 – 55). That is not to say that gifted learners necessarily achieve. Of the top 5% of high school graduates, 40% “do not complete their coursework” (DeLeon, 1989, as cited in Potts, 2017, p. 53), and they drop out. Research suggests that 15% to 40% of gifted students “are at risk for underachievement” (Seeley, 1993, as cited in Potts, 2017, p. 53). Identifying profoundly gifted underachievers can be especially daunting for a couple of different reasons. First, students who are extremely gifted are difficult to identify in general, not only because they represent such a tiny percentage of the population, but also because their areas of precocity or interest sometimes lie outside of core academic subjects (von Károlyi & Winner, 2005). Secondly, it is likely that underachievement will not manifest in profoundly gifted students unless these students have been appropriately challenged intellectually. Underachievement can go unnoticed in this population because these students easily excel at grade level (or even above grade level) school work (Gross, 2004). While an unfulfilling and unchallenging educational environment is often a cause of underachievement in this population…it can sometimes work to mask the symptoms, further obscuring statistical data (Potts, 2017, p. 54). In other words, it may be helpful to challenge learners with work that may bring out their capabilities but not overwhelm them. Those who are gifted often are attracted to particular “intensities” (Plucker & Stocking, 2001, as cited in Potts, 2017, p. 56), so it may be helpful to encourage their exploration and to expose them to various topics. What is the experience of “gifted underachieving”? For one, such individuals may experience “low self-esteem, avoidance behaviors, rebellion” and also internalize their struggles (Potts, 2017, p. 55). There may be struggles with “personal identity and social connections” (Gross, 2000; Gross, 2002; Silverman, 2013, as cited in Potts, 2017, p. 56). Some may perform at lower levels to fit in with peers, so it is important for them to find and socialize with intellectual peers. Many gifted are loners by choice instead of social rejection (Burks, Jensen, & Terman, 1930, as cited in Potts, 2017, p. 62). To support the profoundly gifted, it is important to support and affirm them, to encourage their development of self-efficacy, to head off perfectionism, and to provide constructive criticism to help them develop. Christine Hunt Hjorth’s “Underachievement in Early Childhood Education” (Ch. 4) suggests that underachievement can start in the early education years, which will have implications for the development pipeline as the learners grow up into adulthood. The failure to acquire certain capabilities in developmental windows may mean permanent developmental challenges and knowledge gaps…and lifelong patterns of underachievement. “Early childhood gifted education is an area in need of a great deal more attention. Children who are gifted, are gifted from the beginning,” Hjorth writes (2017, p. 77), referring to both “ability” and “aptitude”. Some indicators of early giftedness may include early reading and early recognition of shapes and colors (Hjorth, 2017, p. 79). Instructors who give “easy As” are not doing gifted underachieving learners any favors because they are boring them, and worse, demotivating them for actual learning and real challenges (Hjorth, 2017, pp. 76 - 77). For some gifted learners, their underachievement may come to the fore when they fail below grade level because they are not doing their work. For others, the underachieving may be more covert with learners not pushing themselves to work at their ability level (Hjorth, 2017, p. 77). For gifted learners in early childhood, there are few programs in the U.S., and regular education teachers may “suffer from misconceptions about gifted learners, and at times even have biases against them” (Cross, 2002; Berger, 2000, as cited in Hjorth, 2017, p. 78). These are particularly sensitive years: From birth to age 8, “school practices have the greatest impact on the child’s educational outcomes” (Grisham-Brown, 2009, as cited in Hjorth, 2017, p. 78). Intriguingly, while boys and girls are now thought to under-achieve at similar rates, they are seen to underachieve differently: “Girls tend to underachieve in more secretive ways, for example, hiding their intelligence. Whereas boys tend to underachieve in more unconcealed ways, such as acting out or manipulating the system” (Hjorth, 2017, pp. 78 - 79), broadly speaking. Gifted learners in their early education years require proper parental support, classroom safety, appropriate curriculum, encouragement for risk-taking, confidence-building, and other supports. Differentiated learning is a basic necessity for supporting gifted learners at every age, and add-ons “extracurricular enrichment” and mentorship cannot replace the basic importance of in-classroom flexibility (Hjorth, 2017, pp. 80 - 81). Kate Bachtel’s “The Heart of It: Emotional Intelligence (EQ) Skill Gaps Contributing to Underachievement” (Ch. 5) focuses on the criticality of those with advanced cognition to have high emotional awareness and skills to engage the world. Bachtel, who works at SoulSpark Learning in Boulder, Colorado, and Supporting Emotional Needs of the Gifted, in the U.S ., asserts that poor emotional intelligence may be a causal factor in gifted underachievement. “Achievement” is defined as “an individual’s capacity to be conscientious in their work, honor commitments and realize personal goals and objectives” (2017, p. 95). The definition of emotional intelligence here is aligned with Six Seconds’ model: “The capacity to blend thinking and feeling to make optimal decisions—which is the key to having a successful relationship with yourself and others’ (2016, n.p., as cited in Bachtel, 2017, p. 96). In addition, skills encapsulated within emotional intelligence include self-awareness (emotional literacy; emotional pattern recognition, such as of habits); self-management (effectively navigating emotions, intrinsic motivation - “gaining energy from personal values and commitments versus being driven by others,” optimism, consequential thinking), and self-direction (empathy, pursuit of noble goals) (Six Seconds, 2016, as cited in Bachtel, 2017, p. 98). In my experiences serving gifted youth, educators and parents and interpreting emotional development data, I have learned teachers’ perceptions of student emotional development levels are often inaccurate. Students who are extraverted and / or charismatic are more likely to be perceived has (sic) having high emotional development. Research reinforces people are poor at estimating their own emotional intelligence levels, as well as the ranges of others (Mayer, Salovey & Caruso, 2016, as cited in Bachtel, 2017, p. 95). Many mistake high levels of socializing with emotional intelligence and introversion for its absence. Emotional intelligence can be developed. The reference to “six seconds” comes from the fact that emotion-inducing chemicals clear from the human body in six seconds. Responses after that time (and actually during that time) is learned behavior and controllable. “ Mindfulness practices support the development of emotional literacy, in accessing the wisdom in each feeling…Navigating emotions is critical to developing consequential thinking as students need to be in a resourced place to evaluate the costs and benefits of potential choices” (Bachtel, 2017, p. 106). To close the achievement gap, learners benefit from developing self-awareness, optimism, intrinsic motivations, consequential thinking; they benefit from cultivating positive social relationships. They benefit from taking on mundane tasks as a necessary part of life (Bachtel, 2017, pp. 109 - 110) and not shutting down from boredom. Finally, Roya Klingner’s “Solution Oriented Coaching for Gifted Underachievers” (Ch. 7) showcases some of the work of the Munich-based Global Center for Gifted and Talented Children, which Klingner (the editor) leads. In this work, she introduces the complexity in proper identification of the causes of failure for the gifted to fully actualize—based on a combination of intelligences and a balance between Robert J. Sternberg’s “analytical, creative, and practical components” (1986, as cited in Klingner, 2017, p.p. 164 - 166). She follows on with sophisticated ideas for constructive problem-solving in order to support gifted learners. "Gifted Underachiever..." is an engaging read. Its insights are useful not only for elite populations but apply to some degree to general populations as well because of the ubiquity of underachievement. This work is a general reminder of how competitive the world is, how hard it is to innovate and make change, and how little compromises can result in major losses of capability (and the dissipation of initial promise). It is too easy for people to be distracted by their challenges in life and to forget earlier ambitions. It can be hard to set-up and follow through on virtuous cycles of individual and group productivity. Also, for many, the persistence required to actually achieve may be lacking. This topic of “gifted underachieving” offers a number of areas of future research. Jessica Potts suggests more study of those considered “twice exceptional underachievers” such as those who are both “gifted” and “female,” or “gifted” and “minority” (Potts, 2017, p. 53), to better understand their needs. It may be helpful to have more direct research with the “gifted,” both over-achievers and under-achievers, and their respective experiences. With the explosion of online learning opportunities and online learning communities, there may be various resources that have yet gone unexplored. Some “genius” research suggests that too much regimented study by the time learners are in early adulthood may be a barrier to full actualization of the individual. It would be interesting to know how effective interventions are in the short, medium, and long terms. Also, are there phases for giftedness over a human life span, and if so, what are they? And do effective support interventions change depending on the phases? 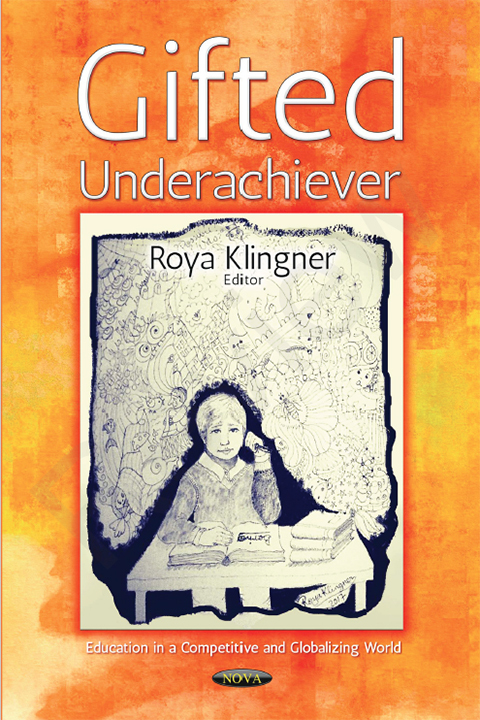 Roya Klingner’s Gifted Underachiever: Education in a Competitive and Globalizing World belatedly focuses on a relevant global issue in this day. [In the U.S., gifted programs at universities started back in the 1980s and 1990s, and many of these programs exist in high schools.] The included works provide useful insights for line teachers who work with exceptional learners from pre-school through university. Discussion of "Book Review: Identifying Gifted Learners and Supporting their Full Potential"
Version 10 id 1545182 of this page, updated 10 January 2018 by Shalin Hai-Jew. Created by Shalin Hai-Jew.